Biomolecular function, in particular protein folding has been predominantly investigated in vitro in aqueous solution, despite cellular conditions are significantly different. Macromolecular crowding alters cellular protein folding dynamics and stability. Further, the high spatial heterogeneity inside living cells causes folding dynamics to vary with cytoplasmic localization and challenges proper folding into native structures throughout the cell. Misfolded proteins in particular in neuronal cells are known to cause severe illnesses e.g. Alzheimer’s, Parkinson’s and Huntington’s diseases. Professor Martin Gruebele’s group developed a new technique which they call Fast Relaxation Imaging (FreI) to map protein folding with high spatio-temporal resolution (Nature Methods, in press). 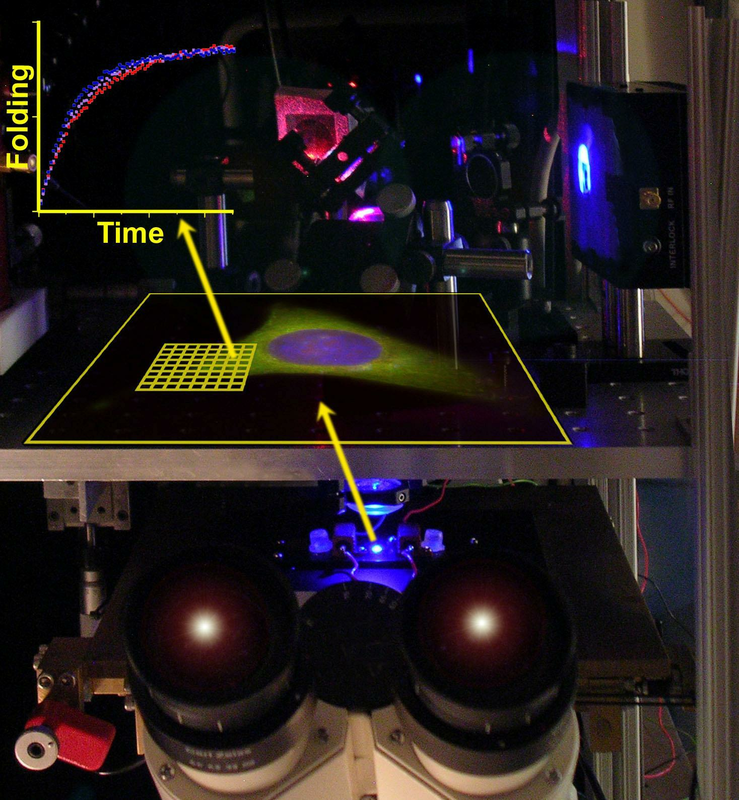 Using millisecond temperature jumps to initiate the folding process they record movies of unfolding and refolding kinetics. They analyze stability and dynamics of a fluorescent phosphoglycerate kinase construct across a bone marrow cell with nanometer resolution (see image). The new technique gives insights of how the cellular environment modifies structure and dynamics of biomolecules compared to the in vitro scenario.